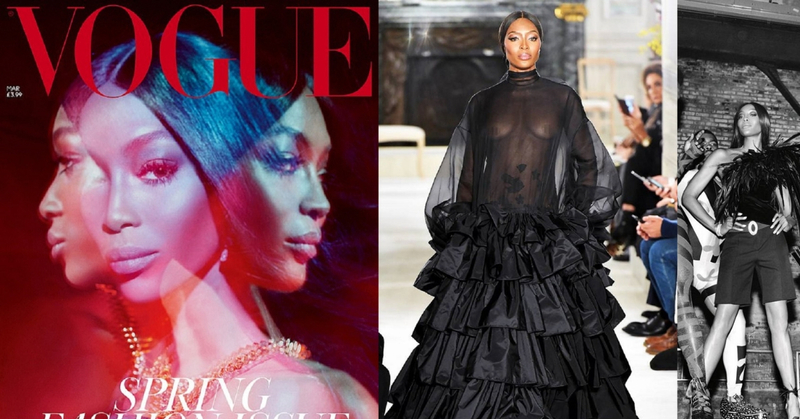 Naomi Made An Epic Comeback At Valentino’s Catwalk and Covered The March Issue Of British Vogue! Naomi Campbell proved her stan at Valentino’s spring show. And again on the cover of British Vogue! The model needs no introduction, Naomi Campbell made her appearance after 14 years at the 2019 Valentino’s spring couture show in Paris. She not only made an epic appearance at the show, but she also closed the show! We aren’t the only one who thinks Naomi’s comeback was an iconic move, Twitter went crazy over the model’s appearance. Naomi THEE Campbell. Closing Valentino Haute Couture spring 2019. Naomi strut her stuff in a Pierpaolo Piccioli design gown. Valentino’s catwalk wasn’t the only headline capturing Campbell’s moment. Naomi also made headlines when she made the cover of the March issue of British Vogue! Over three decades being in the fashion industry, it’s safe to say she has not lost her iconic touch. What’s there not to love? The British model took her fierce poses to her whole new level! We can’t wait to see more of 48-year-old model serve more looks in 2019! What do you think of Naomi’s Comeback? Let us know in the comments!